This week Las Vegas is the center of the atheist movement, as leaders of the largest secular groups in America gather to protest Wells Fargo bank twice. The first protest, Wednesday, April 15, drew 72 people to build awareness for the forthcoming and even bigger protest tomorrow, Friday April 17, at 4pm at the Wells Fargo branch at 1121 South Las Vegas Blvd, Las Vegas, Nevada. Wednesday’s protest went smoothly, with activists holding signs on the sidewalk and public space, and getting a constant flow of honks from passing cars in support. A juggler entertained the crowd and nearly a dozen journalists attended, including 3 video news crews. Even before the protest, the largest newspaper in Las Vegas, the Las Vegas Review Journal, ran an article, Alleged Discrimination by Bank has United Church of Bacon Sizzling. Friday’s protest will be even bigger and more newsworthy, because leaders from seven national secular groups will meet with politicians. Journalists should contact the media contacts to be invited to these meetings. Additionally, several members with large Wells Fargo bank accounts will close them today in protest. Wells Fargo has a history of discrimination, having paid $175 million to settle a federal discrimination case in 2012 for violating the Fair Housing Act. The bank gave loans to African-Americans, Hispanics, and women with bad terms that their white male counterparts did not receive. In December 2014, Chicago’s county sued Wells Fargo for discriminating against black, Hispanic, and female mortgage customers. Then last year Wells Fargo refused to notarize a document for John Whiteside, an atheist who owns a protest church with a funny name, The United Church of Bacon, chosen intentionally to dramatize how unfair it is that banks get special privileges under the law. Notaries are not allowed to refuse requests from those with valid IDs, nor give their personal opinions about whether they believe atheists are good people or a church that rejects God is bad for society. That’s discrimination. Whiteside’s event is attended by the leaders of six other national groups, the American Atheists, the American Humanist Association, the Secular Student Alliance, the Secular Coalition for America, the Military Association of Atheists & Freethinkers, and the Secular Policy Institute. Local leaders, jugglers, and other performers from Las Vegas and Hollywood will also attend. Discrimination against atheists, those who do not believe in God, or secular people, those who may be spiritual but want separation of church and state, is called atheophobia or secularphobia. John’s church was founded to draw attention to the issues of skeptics and atheists such as this week’s protests, and it also raises money for other charities while rejecting any donations for itself. The church also claims no tax-free status. It pays taxes. Just in 2014 the church’s 4,000 members raised nearly $100,000 for cancer, autism, and secular charities. Those gathered aren’t asking for much. 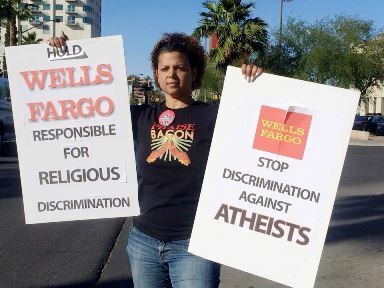 Instead of suing Wells Fargo bank for $5 million dollars, as a group of pregnant women who had been discriminated against recently did, they are simply asking for an apology and for Wells Fargo’s anti-discrimination training to include atheists and secular people. They also ask Nevada Governor Brian Sandoval and the Nevada Equal Rights Commission to give the case more than a cursory glance. Press is invited to attend. American Atheist is the premier organization fighting for the civil liberties of atheists and the total, absolute separation of government and religion. The Military Association of Atheists & Freethinkers educates and trains both military and civilian communities about issues relating to nonbelievers in the US Armed Forces. The Secular Student Alliance empowers secular students to proudly express their identity, build welcoming communities, promote secular values, and set a course for lifelong activism. The Secular Coalition for America lobbies the U.S. Congress on issues of special concern to secular people. The Secular Policy Institute is the world’s largest secular think tank and world’s largest coalition of secular groups.